Design Indaba 2018: Dutch designer Lonny van Ryswyck on creating stronger ties between people and the earth’s materials. The planet's sand reserves are under serious threat. Fuelled by a worldwide construction boom and increasing urbanisation, aggressive sand mining is eroding beaches, damaging infrastructure, disrupting ecosystems and giving rise to illegal trade governed by a brutal ’sand mafia’ that isn’t afraid to kill. The UN estimates that the mining of sand and gravel may exceed 40 billion tonnes a year. The problem is that the material is being extracted at a rate far greater than its renewal: three-quarters of the world's beaches are in decline, and that’s just the start of it. But sand plays a key role in our daily lives. It’s not just in our concrete – our houses, studios, pavements and roads. Sand is made from silicon dioxide, which can be found in a phenomenal range of products that we use on a daily basis: paper, glass, cleaning products, toothpaste, wine and so on. So what happens if the world runs out of sand? And what are we doing to preserve it? Those were the questions posed by Dutch designer Lonny van Ryswyck at Design Indaba 2018 in Cape Town last week. 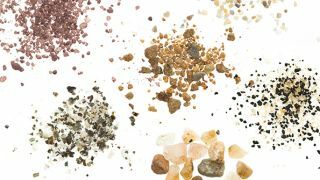 The Atelier NL co-founder’s latest project, A World of Sand, seeks to create stronger ties between the earth’s materials and living communities, while also drawing attention to sand as a vastly diminishing resource. Since 2010, van Ryswyck and her studio partner Nadine Sterk have been collecting wild sand from dunes, beaches, rivers, mountains and quarries to make their own glass. The pair melt the sand specimens down to reveal the stunning, unique colours and textures of each location, before reshaping the material into tangible, every day objects. They’ve also called upon the global community to send in samples. Slowly, through a process of research and experimentation, Atelier NL is mapping the earth via its local raw materials – and the studio is sharing the stories of its sand contributors. Submit your own sand sample to the project at the World of Sand website.